Even 13 years after wreck of SSN Kursk, Russia won't have deep-sea diving system to rescue submariners. Nuclear-powered attack submarine Kursk sank on August 12, 2000 at the depth of 108 meters during the exercise in the Barents Sea. Most of people on board (crewmembers and industry experts, totally 118 men) died at once. Only 24 submariners in 9th compartment were fighting for their lives fr om several hours to several days, as different sources report. Right after the accident, rescue assets of Northern Fleet were dispatched to the area of occurrence. A rescue submersible headed for the submarine lying on the seabed and made several attempts to "stick" to escape hatch coaming. Unfortunately, everything was in vain. Due to mechanical damage of the coaming, it was impossible to dock with the sub. The fleet's emergency rescue service could not help submariners by any other mean. Even batteries of the rescue submersible were exhausted to the limit and needed changing long ago. Submariners blocked in 9th compartment had no chance of survival. There were no other rescue means not only at Northern Fleet but in the whole country. No deep-sea divers, no equipment to open the escape hatch. All remained fr om Soviet Navy had finally gone. After all, Russia had to drum up foreign support. In October 2000, Norwegian divers attempted to get into stern compartment. Only with their help rescuers managed to pull bodies of died submariners out of the compartment. Divers need special breathing mixtures to operate at great depths wh ere water pressure is several times higher than the atmospheric one. To prevent caisson disease and "blood boiling", rapidly surfaced rescuees and divers must be placed in decompression chambers, sometimes for several days. Equipment providing divers' work and accommodation for rescued people constitutes deep-sea diving system. Had Russia operated such system at that time, perhaps, the story would end up differently. Russian Navy command realized the need for up-to-date complex aids to rescue submariners. Import of foreign deep-sea diving equipment and remotely-controlled submersibles began in 2001. But there was a lack of main thing – a special vessel capable to detect damaged submarine, examine her and render assistance to the crew. Right after the Kursk tragedy, Almaz Central Design Bureau (St. Petersburg), traditionally dealing with salvage ships, started developing of a new-generation rescue vessel. The project obtained the number of 21300 and a codename of Delfin. The project was approbated by the end of 2005. A large and experienced shipbuilding company Admiralteyskie Verfi was chosen the order executor. The ship named Igor Belousov was laid down in December 2005. Although the ship's delivery was initially scheduled in 2010, even at that time it was clear to experts that the deadline would be postponed due to new technical solutions and irregular financing. The Lazurit Central Design Bureau (Nizhniy Novgorod) was chosen a developer and supplier of diving system for the new ship. The choice was logical. First, the bureau was experienced in designing of analogous world-class equipment. The Lazurit designers developed unique Lenok-class rescue submarines; Russian Navy still operates Bester-type rescue vehicles and other rescue systems designed by the bureau. Second, it was important to keep Lazurit afloat, because in 90's it was on the verge of bankruptcy due to the lack of orders. Navy command set high requirements to the diving system (operating depth, capacity of decompression chambers, etc). According to technical specifications, the rescue ship is supposed to help crews of damaged submarines and surface vessels, and perform underwater works in outlying maritime zones. For that end, the ship must be equipped with unmanned submersible to provide search and examination works, Bester-type deep-sea rescue vehicle (designed by the Lazurit bureau), and two imported normobaric diving armors (maintaining atmospheric pressure inside at all diving depths). The deep-sea diving system must provide execution of underwater works at depth down to 500 meters and accommodation for 60 persons in decompression chambers (rescued submariners and divers). Rescue ship Igor Belousov was officially laid down by the beginning of 2006. Initial financing for construction determined by the state contract was RUR 6.4 bln. That sum also included development cost of diving system. When Lazurit started its part of work, it became apparent that available assets and money are not enough to create deep-sea diving system. By permission of Navy Deputy Commander Vice Admiral Nikolai Borisov later fired by presidential decree for failed negotiations on French Mistral ships, it was decided to involve an Italian company to deliver associated hardware. Generally, work on the diving system was going on slowly. Excusing low rate of works, Lazurit bureau insisted on additional researches, asked for deadline shift and increase of financing. There were no other designers, so defense ministry had to consent and allocate another RUR 1.095 bln for continuation of works. Later on, to justify breach of work schedule, the bureau's leaders said the money had been received with delay and in deficiency, so the military was the one to blame. According to a source at Admiralteyskie Verfi, that was in contrary to fact – money for the diving system were appropriated in sufficient volume. Part of money was even rejected, since the bureau simply could not spend it. Works on the ship construction went not at a swift rate. Only the hull had been completed since the keel-laying. Last but not least reason was the project complexity. Such ships have not been built in Russia for a long time. Such situation had been lasting till the middle of 2011 when problems of defense order reached the summit level. Enormous money was appropriated for procurement of naval arms and shipbuilding. Besides, they remembered about the special-purpose vessel Igor Belousov so vital for Russian Navy. 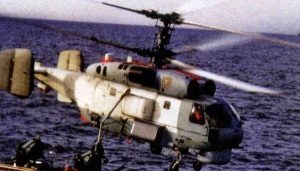 Defense ministry and the Navy renegotiated contract with Admiralteyskie Verfi and set a new delivery deadline – 2014. Total sum of the contract was almost doubled reaching up RUR 12.5 bln. To execute defense order in time, Admiralteyskie Verfi and Lazurit had to take pains. By the end of 2011, the deep-sea diving system was 70% completed. Lazurit promised to finish all works in case of additional financing, but anyway it could not meet the contractual deadlines. The diving system could be ready only in 2013 which would eventually shift the ship's delivery date to 2015. 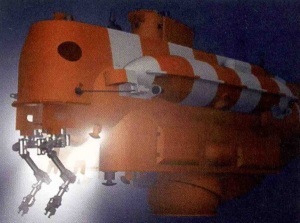 Defense ministry considered that unacceptable, ceased to fulfill contractual obligations as of designing of Project 22020 deep-sea diving system GVK-450, and began to search for another supplier. And it was found very soon. Group Company Tetis Pro offered to comply with delivery request for analogous diving system. Tetis Pro is well known in Russia as a supplier of diving, emergency rescue, and security equipment. Many retired naval officers including high-ranking ones work in the company. Largest customers are Federal Security Service (FSB), Federal Protective Service (FSO), Ministry of Internal Affairs, Russian Navy and other agencies. The operating policy is simple and effective – the company imports foreign equipment, adapts for certain demands, and offers to a customer. For that purpose, the company has its own production capacities. However, Tetis Pro has never sold such product as a naval diving system having no analogs worldwide. The documents justifying rejection of Lazurit's services and appointing Tetis Pro as supplier of a deep-sea diving system mention the term "batch-produced" several times. It is curious, since the system has not been manufactured yet. Perhaps, some equipment like decompression chambers is really produced batchwise in the West, but apparently not in the kind suitable for Project 22020. Logically, doubts are cast upon full accomplishment of initially approved technical specifications, because they will be obviously neglected. Even now it is known about inevitable derating of some performance characteristics. For instance, capability to work at depths down to 500 meters and at wind force 4 was excluded from the specifications. As of general characteristics, Tetis Pro promises to meet specified requirements (capacity of decompression chambers remains same – 60 persons). Deadline is the issue of special interest. Tetis Pro assures that after receiving of procurement request from the Navy, the company surveyed world market of diving equipment, consulted leading foreign manufacturers, and only upon receipt of guarantees from one of Scottish firms, it offered that equipment to the Navy. By the way, conditions were far better than the Lazurit bureau offered. For one, Tetis Pro was ready to perform additional erection supervision works while Lazurit refused to. Moreover, requested price was 100 million rubles fewer than the Lazurit's one. And what surprises now is cost. Why imported equipment would be cheaper than the domestically-produced one? Russian Navy and the industry – the manufacturing plant and the design bureau – assented to the Tetis Pro offer. Neither financing of the rescue ship's completion appropriated under state defense order nor delivery term were officially changed. About 1.5 years left until the scheduled launching of the ship. Will the chain "Tetis-Almaz-Admiralteyskie Verfi" manage to fulfill contractual commitments in time? It is unclear so far. There is no official reasoning why Tetis Pro was chosen an alternative supplier of diving system. Was there any tenders held? No information has been reported in this regard. There is another problem though. Lazurit bureau was designing the system in accordance with technical requirements approved by all interested organizations and Russian National State Standards (GOST). Will the imported diving system comply with those documents? For instance, JSC Tetis Pro offered a diving system constructed under internal technical specifications not coordinated with the Navy. According to information available to Central Navy Portal, no independent review has been carried out into the Tetis Pro offer. Naval commanders and industrial bosses believed on bare words and signed a joint protocol. So far, Tetis Pro and Admiralteyskie Verfi shipyard have not signed the contract for equipment delivery. Sources in defense ministry say it is a matter of few days. So, what is in the end? On the one hand, there is Russian ineffective manufacturer which is either incapable or unwilling. Sure, numerous cases of corruption activities like thievery and kickbacks don't make much impression in the present-day Russia. Representatives of quite successful companies complain that the government wants crucially new products but gives money only for production not implying modernization of machinery. However, it is impossible to convert to nanotechnology having only hammers in hands. It becomes apparent that at this stage our government is incapable to track investments effectively and, perhaps, that is why it allocates funds like "if only it is enough". On the other hand, there is a foreign manufacturer which seems to have a good deal of groundwork. However, on closer examination it turns out that its technical level is insufficient, performance characteristics are lower than required ones, no documentation, and there are reasonable doubts about the main thing – time schedule. And then arise questions regarding what the criterion for supplier selection was, when the open tender was held, and what happened to list of technical specifications. Looks like there is a free scope to corruption. Take note, soon we will experience all pros and cons of imported military products beginning from Mistral amphibious ships and ending with shipboard furniture. So, it seems like there is no "rescue" whichever way we turn. Wide-spread corruption and incompetence make every way dead-locked. Will anything change through the next six years?